Is fear of nuclear terrorism distracting us from more realistic threats? Home / General Interest / Is fear of nuclear terrorism distracting us from more realistic threats? A number of terrorist groups, including ISIS and al-Qaeda, have expressed explicit intentions to acquire and use nuclear material. However, countries face far more pressing threats than nuclear terrorism and authorities would be better off focusing on insurgents’ frequent use of conventional weapons, such as chemicals and bombs. Nuclear terrorism, defined as “the use or threat to use nuclear material, nuclear fuel, or radioactive products for acts of terrorism,” has elicited global concern and action, as demonstrated by the UN Global Counter-Terrorism Strategy, NATO’s Defence Against Terrorism Programme, and the EU Counter-Terrorism Strategy. There is also a large amount of nuclear material present throughout the world; the current global stockpile of highly enriched uranium (HEU) stands at 1.6 million kg. To construct a nuclear bomb, terrorists would need 25 kg of HEU. This, compared to the amount held by states throughout the world, is not an impossible amount for terrorists to obtain. 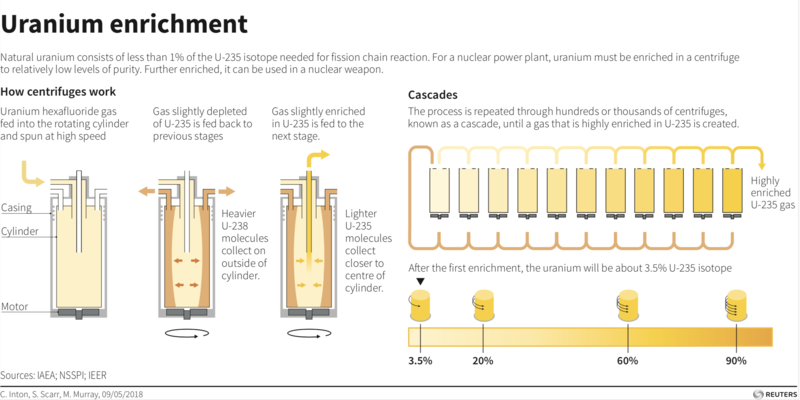 To contextualize this, in 2015 the United States possessed 62,900 tons of recoverable uranium. In 2014, after capturing the Iraqi city of Mosul, ISIS had access to two caches of Cobalt 60 locked in a storage room at Mosul University. This material has lethal levels of radiation, is used to treat cancer cells, and is the core ingredient of a nuclear bomb. Government officials and nuclear experts speculated that ISIS failed to utilize it, because they could not determine how to access the Cobalt 60 without exposing themselves to deadly radiation. In 2016, after the two ISIS brothers involved in the Brussels bombings, Khalid and Ibrahim el-Bakraoui, were killed and captured, authorities discovered they had been secretly watching a Belgian nuclear scientist who worked at the Tihange Nuclear Power Station with the potential aim of using material from this facility. Despite Obama’s remarks in 2016 and these two incidents, experts and officials contest the viability of the nuclear terrorism threat. Dr Beyza Unal, a research fellow in nuclear policy at think tank Chatham House, argued there is currently no evidence that terrorist groups could build a nuclear weapon. Similarly, a report by the Council on Foreign Relations in 2006 emphasized how building a nuclear bomb is a difficult task for states, let alone terrorists. This is because of the issues involved in accessing uranium and creating and maintaining it at the correct grade (enriched uranium). While nuclear terrorism is a concern, the majority of terrorist attacks are conducted with conventional explosives. The 2017 Europol Terrorism Situation and Trend Report states that 40% of terrorist attacks used explosives. These explosives originate from a wide variety of countries across the world. According to a study by Conflict Armament Research, large quantities of explosive precursor chemicals used to make bombs as seen in the 7/7 attack in London in 2005 and the 2017 Manchester Arena attack, have been linked to supply chains in the United States, Europe, and Asia via Turkey. The threat from the spread of chemical precursors prompted the EU to begin looking at ways to tighten the regulations of these chemicals (PDF). A nuclear terrorist attack would have grave consequences, but it is currently not a realistic or viable threat given that it would require a level of sophistication from terrorists that has not yet been witnessed. The recent focus of terrorist groups has been on simplistic strikes, such as knife and vehicular attacks. If countries are concerned about nuclear terrorism, the best way to mitigate this risk could be to tighten security at civilian and government nuclear sites. But governments would be better off focusing their efforts on combatting the spread and use of conventional weapons.